Musica Cronica's Made In America is back from vacation and man was it ever an exciting August for music fans in the States. First let me address "vacation" from an American point of view. Americans don't generally take vacations like Europeans do. We spend a lot of time hoping that a national holiday falls on a Friday or a Monday where we can have three days off instead of two and during that time off we just think about how to work more. Basically, Americans work and then they die. Now on to the music! August brought us the highly anticipated reunion of The Replacments. Twenty-one years ago after their last gig, Paul Westerberg and Tommy Stinson reunited on stage at Toronto's Riot Fest. Of course I couldn't go because I had to work. Stereogum has the 22-song audience-recorded set available for your downloading pleasure. In new music news one of my favorite bands of all time Superchunk release their 10th studio album I Hate Music on Merge Records and is following with an American, Austrailian and UK tour. This led to the creation of my Super-Superchunk Weekend, three days three shows. Terminal West in Atlanta, Georgia, The Grey Eagle in Asheville, North Carolina and then in their hometown of Chapel Hill, North Carolina at the famous Cat's Cradle. I think I danced away at least three pounds. Now, Made In America: This week it's the Denton/Austin, Texas trio Bad Sports with their third album Bras out last week on Dirtnap Records. 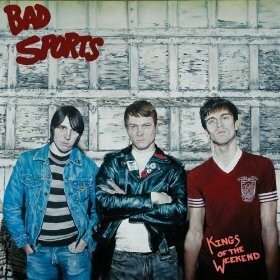 Fans of late the late 70's pop/punk and garage sound of The Ramones, The Dead Boys or even Buzzcocks from across the pond will know where Bad Sports is coming from. Although not as snarly as their 2011 album "Kings Of The Weekend", "Bras" still has Bad Sports within the realm of that hot dank garage but this time the garage has a comfortable albeit trashy couch in it. Standout songs for me include "Nothing In This World and "Terrible Place".